"The Art Happens Here: Net Art's Archival Poetics" is now on view at the New Museum through May 26, 2019. In sixteen works from throughout net art history, this exhibition showcases a wide range of forms—websites, software, sculpture, graphics, books, and merchandise—while offering a space for considering the internet as social process, material infrastructure, and lived experience. The works on view have been selected from "Net Art Anthology," our major online exhibition featuring one hundred works that sketch a possible canon for net art. Learn more about the exhibition and how to visit the New Museum. 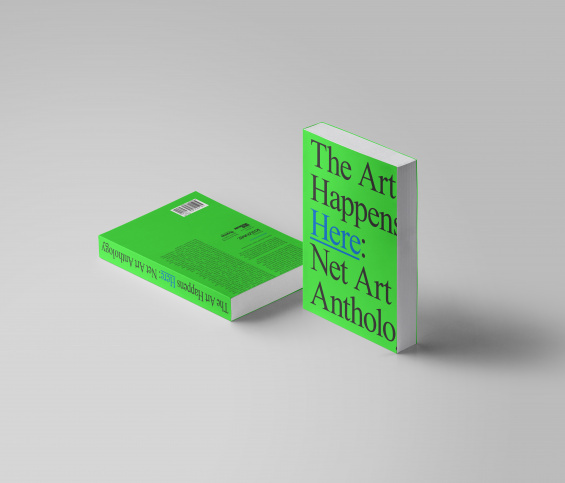 "The Art Happens Here" is accompanied by a significant, 435-page catalogue detailing the full "Net Art Anthology," with new thematic essays by Michael Connor, Aria Dean, Ceci Moss, Josephine Bosma, and others. A limited number are available on pre-sale at our webstore. Books will be on-hand, and for sale, at a catalogue launch event at the New Museum on January 31, 2019. Info and tickets. This exhibition is made possible by the generous support of the Carl & Marilynn Thoma Art Foundation. Additional support provided by Greg & Yukari Pass, Mihail Lari & Scott Murray, Fred Benenson, Josh Wolfe, Raquel Cayre, and Lisa Schiff. Intel generously provided Intel® NUCs to present "The Art Happens Here."